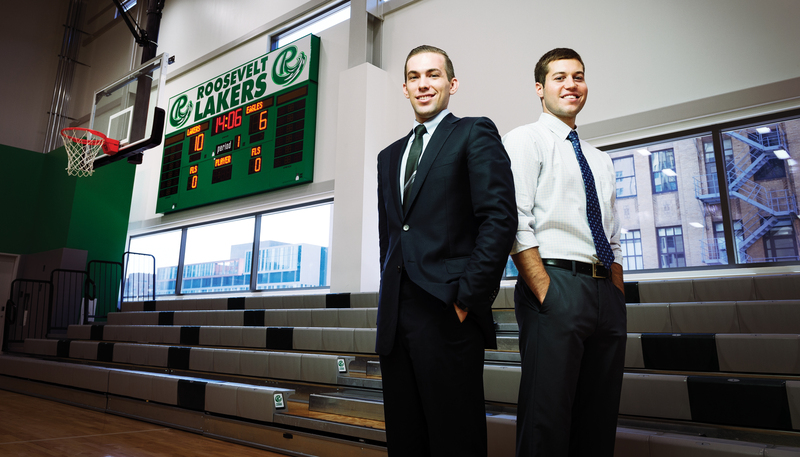 After earning degrees from Roosevelt, former men’s basketball teammates Tyler Smith (left) and Mark Tometich are now working in Chicago. Data from a 2013 NCAA research study show that less than two percent of college athletes go on to play their sport on a professional level. For the vast majority of student-athletes, the chances of continuing a competitive sports career as a means to a living are slim to unrealistic. Student-athletes at Roosevelt are well aware of those odds and are using their education, athletic training and contacts throughout the University to help them obtain jobs in a variety of professions. While at Roosevelt, he held a variety of jobs to make ends meet and volunteered as an intern for the athletic department to gain experience working games, writing collateral materials and maintaining websites and he jumped in as a student assistant coach for the basketball team in the middle of the 2012-13 campaign when another assistant departed. Shortly after graduating in 2013, Smith was offered a job at The W Chicago City Center, and just recently he turned that experience into a new position as sales coordinator for The Westin Michigan Avenue hotel. On the court, Tometich was an All-Chicagoland Collegiate Athletic Conference sharpshooter who set the Roosevelt record for three-point baskets made in a career. Off the court, he was determined to get his degree and a good job following graduation. He succeeded by being hired as a financial consultant at The Northern Trust, a $106-billion bank, located just a short distance from the Lillian and Larry Goodman Center, which he now frequents as a fan. One of those resources is the Office of Career Development, where all Roosevelt students can go to get assistance creating and developing resumes and cover letters, engage in mock interviews, get career and major exploration assessments, and seek advice on internship and job search strategies. “We know how tough it is to be a full-time student-athlete and try to build a resume for post graduation, so we thoroughly enjoy helping student-athletes build their resumes while having to navigate a tough schedule,” said Aaron Kennedy, student placement specialist. Kennedy advises student athletes to gain work and internship experience during their off-seasons and asks student-athletes to consider various student employment opportunities on campus that provide meaningful work experience. Alexia Tann was a standout point guard during Roosevelt’s first two women’s basketball seasons, but her time in Green and White proved to be a tale in perseverance. One of the Lakers’ leading scorers in the beginning of the 2010-11 season, she tore an anterior cruciate ligament (ACL) sidelining her for the remainder of the year. Despite the lengthy and difficult rehab for her knee, Tann returned in 2011-12 and led the Lakers in assists before her career came to an end. Alexia Tann’s tenacity as a point guard for Roosevelt’s women’s basketball team served her well in beginning a professional career after her playing career concluded. Tann is now happy doing what Scherr-Wells did to lure the Beloit, Wis. native to Chicago: recruiting. She works at a temp agency as a professional recruiter, placing people in the right positions like she did when she was the floor general for the Lakers. “Once it’s gone, it’s gone.” That’s how Tim Storrs succinctly described the finite length of a collegiate sports-playing career. An infielder on the Lakers’ baseball team and a 2012 business graduate, Storrs is currently a commercial underwriting analyst for Ally Financial, a worldwide bank with more than 15 million customers. One of Storrs’ teammates on the 2011 and 2012 Roosevelt baseball teams was Ernesto Irizarry, a catcher who was one of head coach Steve Marchi’s top hitters. Irizarry was attracted to the University because of the athletic program and the offering of a criminal justice major. Thanks to Marchi and assistant coach Mike Schultz, who Irizarry credited with pushing him harder to excel academically, Irizarry attained his bachelor’s degree and is currently an administrative assistant at a local law firm. Next fall, he plans to enter law school to pursue a career in criminal law. Even though their time as Roosevelt students and Laker athletes went by more quickly than Irizarry and others would have preferred, these five graduates maximized their brief tenures at the University in a manner that can last a lifetime. They took advantage of their opportunities and showed that athletics can be a stepping stone to a fulfilling career. Roosevelt Lakers Continue to Rise The 2014-15 season is shaping up to be a promising one for the Lakers despite graduating top players on a number of teams, including All-American women’s basketball star Casey Davis (dribbling) and six baseball seniors, among them Nathan Greene (15) and Alex Van Ness (pitching). Some of the veteran athletes returning are men’s soccer players Hayden Hagemann (4) and Diego Rivas (11) and men’s basketball player Kevin Priebe (above, right). Roosevelt student Steven Mane contributed to this story.